We’ve researched plenty of smart locks, but two of our absolute favorites are Nest x Yale (or Nest Yale for short) and Schlage Connect. Both locks have convenient keypads and a modern look, but there are some key differences worth noting. We installed and tested both locks, so let’s compare Nest Yale vs Schlage to figure out which one works best for your home. When stacking up Nest Yale vs Schlage Connect, both locks have touchscreen keypads so you can set up door codes and don’t have to use the app and can easily give access to guests. Each lock has its pros and cons depending on your smart home setup. In this article, we will compare both locks in a few different categories and choose a winner in each section. At the end of this article, we will select an overall winner between Nest Yale vs Schlage. 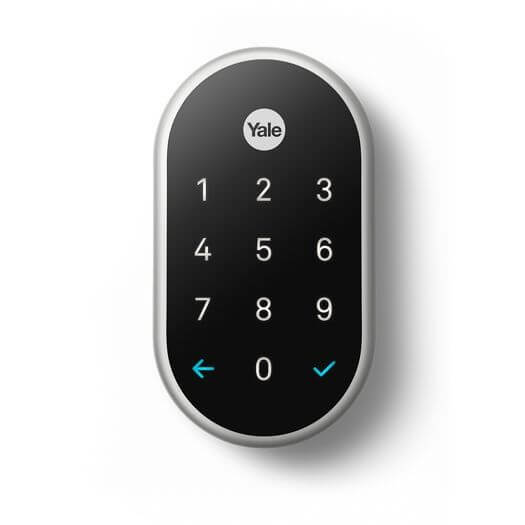 As you’ll see in our Nest Yale lock review, we loved the lock’s beautiful design and easy functionality within the Nest app. We tested the low battery mode, notifications, and even used it with gloves in this video. Read our article review for Nest x Yale for even more details. Schlage Connect has quite a few unexpected features. We received notifications with our smart watch, enabled the siren, and locked the door using Alexa. It uses the SmartThings app to set door codes and control the lock, and our review shows a little of how this works. We wrote all about our experience with Schlage Connect in a longer article review as well. Setting up the locks is similar overall. There is no special wiring since each lock just requires 4AA batteries, which should last you around a year. Both locks between Nest Yale vs Schlage can be installed using a simple screwdriver; advanced handyman skills are not required. However, if you want to hire someone to install it, then you can book them through Amazon for Schlage or Nest’s website for Nest x Yale. The locks work on standard doors with a deadbolt and normal backset. You’ll want to install the bolt on the door, the strike on the doorframe, and the touchscreen on the outside of the door. For exact measurements and step-by-step instructions, take a look at Nest and Schlage websites. There are a few common issues we encountered when setting up each lock, as listed below. Requires either Nest Connect or Nest Guard. Nest Connect plugs into an outlet to wirelessly connect your lock to the WiFi. Nest Guard is the base/keypad for the Nest security system. If you don’t have the Nest security system or plan on purchasing it, then just make sure you buy a lock that comes with the Nest Connect. Purchase the lock at any third-party store and it will come with the Nest Connect, or if you don’t need it then you can buy the lock on its own for a little cheaper through Nest’s website. Potential setup issues. 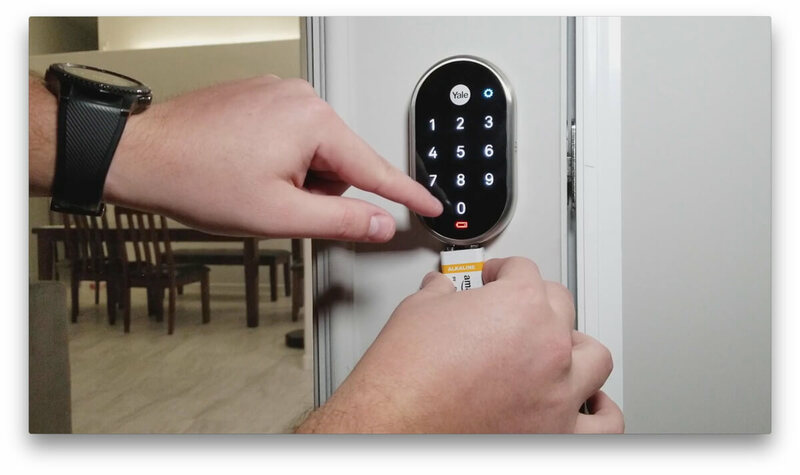 When setting up the Nest Yale lock on a few different doors, we encountered the same issue: initially, the lock wasn’t able to close using the app. That’s because it wasn’t quite a smooth transition and needed to be smoothed out a bit. We used a drill and chisel to dig into the door frame and make it a bit deeper. This takes a little maneuvering and may be frustrating, but in the end it worked out fine. Requires a third-party hub. To use your lock remotely or connect it with Alexa, you’ll need to connect it using a Wink or SmartThings hub (we compare the pros and cons of both hubs here). While these hubs will help you connect several of your smart home devices within one app, it can add unwanted complication and cost for users who want to keep it simple. Potential setup issues. While installation is simpler than the Nest Yale lock, it can complicate things in the long run. If the lock encounters any resistance during its initial setup, it won’t give you an error message like Nest, but instead it will just use more force to push through. After that, it will continue to use the same amount of force to lock your door, which drains the batteries faster. This makes initial setup seem easier, but it can be annoying if it ends up draining your batteries. Low battery alerts. Nest Yale alerts you within the app and with a low battery notification on the lock. Schlage has a yellow low battery light indicator, and it will also unlock at a slight delay as a way to remind you. Functionality even when the WiFi is down or the power is out. While you won’t be able to add codes, change settings, or lock/unlock the door using the app, the keypad on each lock will continue to function even without internet or power. There are also a few differences in comparing Nest Yale vs Schlage hardware. More polished look. This “smart” lock looks truly smart. Its display is very high quality and top of the line. No keyhole. The backup for if your batteries die is a 9-volt battery port on the bottom, which provides enough power to punch in your code and enter. This may not be a deal-breaker, but if you want a traditional key then Nest Yale isn’t your choice. ANSI Grade 2 – less secure certification than Schlage Connect. Lifetime warranty for finish and mechanical parts; two-year warranty for electronics. Traditional look. 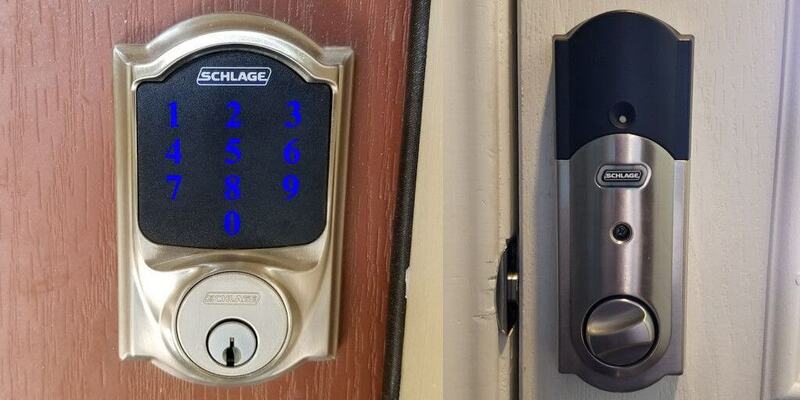 Schlage is a little more basic looking when compared with Nest Yale. While it may not amaze your guests, it still has an impressive look overall. Exterior keyhole for manually locking or unlocking using a key. This is a great back up if your batteries die or you forget your code. ANSI Grade 1 – most secure certification available for locks. Available finishes: Aged Bronze, Bright Chrome, Camelot, Matte Black, Satin Chrome, and Satin Nickel. Lifetime limited warranty for finish and mechanical; one-year warranty for electronics. This category was a close call—comparing the hardware of Nest Yale vs Schlage shows that both have their own advantages. 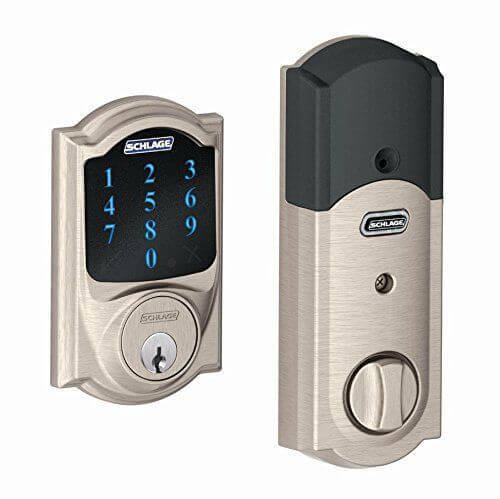 While Schlage Connect has a few improvements over Nest, its bulky, old fashioned design is very obvious when compared with the beautiful Nest x Yale lock. The newer Nest Yale lock has a minimalist and very modern look, while still offering an improved warranty. As someone who has used both locks in my home, Nest Yale easily has the more subtle, smart, and impressive design. 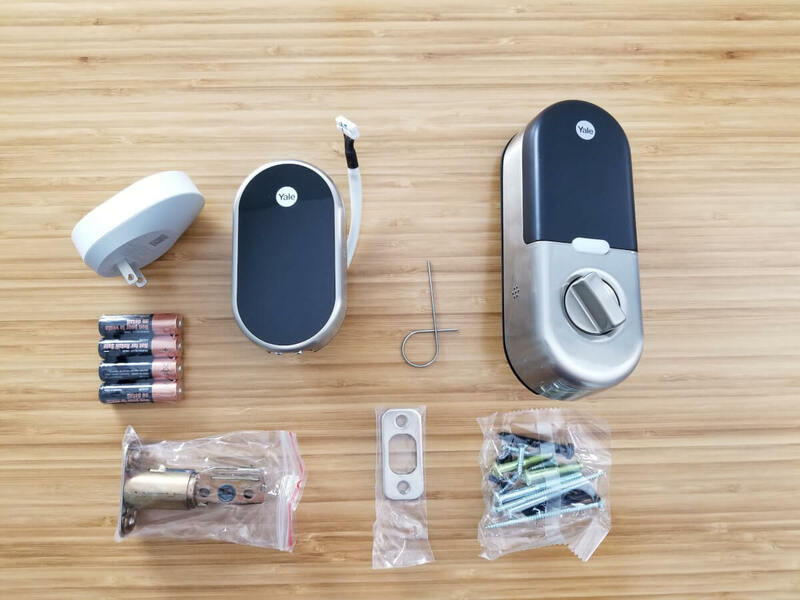 You will want to opt for the Schlage Connect if you don’t mind its basic design and want an exterior keyhole as a backup that is more practical than a 9V battery. It’s also rated more secure and has more finishes offered. For these reasons, it’s still a compelling option in this category, but we still award it to Nest for its superior design. Both locks have touch screens that work even if you are wearing gloves. However, there are a few big differences between the features of Nest Yale vs Schlage. No chirping options or siren for opening when armed, but Nest x Yale does have an audible alarm and send alerts if someone attempts to tamper with the lock. Speaker on the lock has a voice that walks you through the setup. Requires you to press on the checkmark after inputting your door code, which is an extra and unnecessary button to press. Lock includes a built-in siren to alert you of forced entry. You can also set up a chirp that sounds each time the door is opened. No speaker on the lock, other than the siren which alerts you of forced entry. Door unlocks immediately after you input the correct code – no extra buttons required. Auto-unlock feature available through SmartThings or IFTTT to have your door unlock when you arrive home. Note that this feature is not very secure, nor is it recommended by the manufacturer. Schlage’s door chirping feature make it easy to know when the door is opened and lets the door lock double as a traditional door sensor that you would see on most security systems. The door is also faster to unlock since you don’t have to press extra buttons after inputting the code. Overall, Schlage Connect is built with more features and customization to make this lock your own. You can lock, unlock, and check the status of the door using either app, without any monthly fees required. As long as a hub or Nest Connect is hooked up, this functionality is also available remotely for either lock. Both locks allow you to easily make pass codes for guests, although extra options come with Nest compared to Schlage. Automatic locking is available for both locks after specified amounts of time. The software is also very secure, with AES-128 bit encryption for both locks. You can easily receive notifications for both Nest Yale and Schlage Connect. These can alert you each time the door is locked or unlocked based on your preferences. A detailed timeline shows who unlocked the door at what time within each app as well. Manage lock using the Nest app. This is very easy to use, even for beginners, and it combines your Nest cameras, thermostats, doorbell, and security system all in one app. The Nest app doesn’t have as many options for customization since it is more user-friendly and basic. Set pass codes to expire at a certain date and time. You can also schedule when a passcode can work, which is perfect for your dog walker or occasional guests. Pass codes must be 4 to 8 digits long. The codes are flexible since you can have some codes that are 8 digits, others that are 6, and some that are just 4. Nest can also automatically lock when it senses you are gone. This is called Away mode, and it works in conjunction with your thermostat and other Nest products. If you leave your home and Nest sees that you’re in Away mode with the door unlocked, it will automatically lock. This is a nice fail-safe to ensure you don’t forget to lock the door. Offers privacy mode both directly on the lock and within the app. 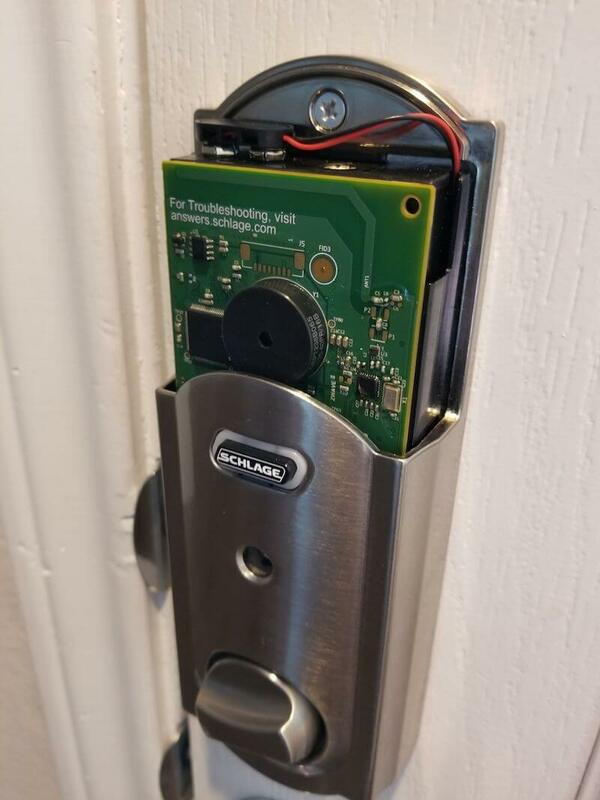 This blocks anyone from using door codes to enter your home. There is no native Schlage app. To set codes using an app or control lock remotely, you have to use the app for whichever Z-Wave hub you select. For example, we use the SmartThings app to control our Schlage Connect. This makes for a bit more of a learning curve since these hub apps are not as straightforward and offer more options for automation. It is not ideal for smart home beginners or those looking to keep it simple. More customization available in the SmartThings/Wink app compared to Nest. Codes require a little more manual controls. While they can automatically expire or be scheduled, it’s difficult to manage. Pass codes must be 4 to 8 digits long. The annoying part is that all codes must be the same length. 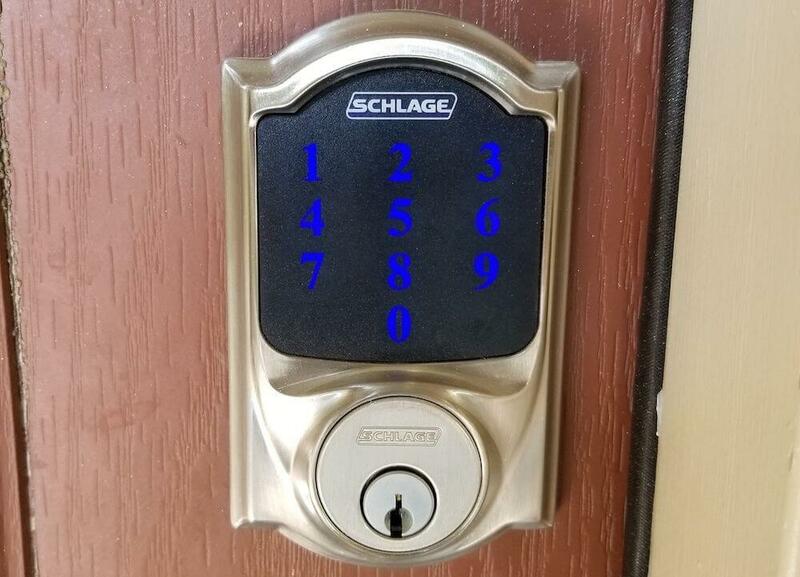 So if you want a longer 8-digit code for your dog walker, and a shorter code for your mom, that’s impossible using Schlage Connect. Automatically lock the door when you leave home using IFTTT or SmartThings. No privacy mode option to prevent all user codes from working. While this might not be a popular feature, it’s an extra security measure if it’s something you would utilize. 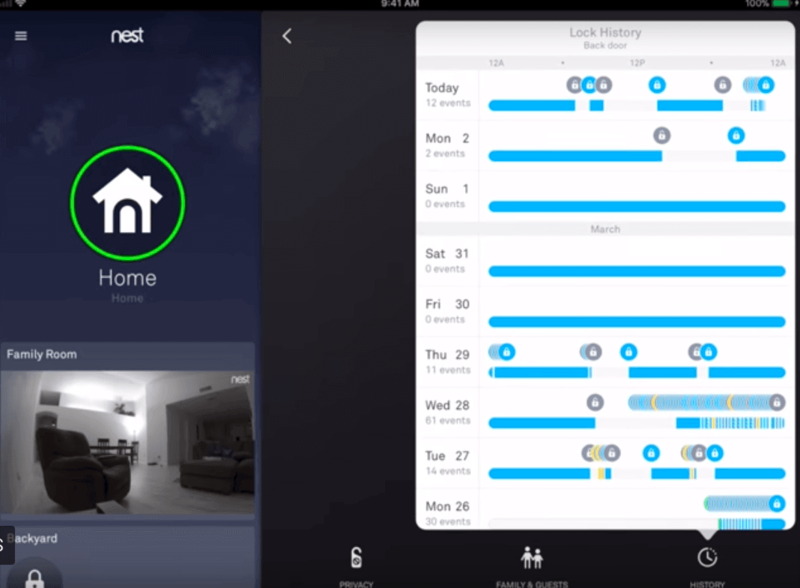 The Nest app is very user friendly and includes all of the Nest products in one quick view. I really like that I can check my security system, door lock, thermostat, and Nest Cams all in one place without a third-party hub required. Its Away mode is also very easy to configure, and privacy mode could prove beneficial for locking out those family members that abuse their door code at the worst possible times. If you aren’t all-in on the Nest ecosystem and would rather have more user controls, Schlage is still a solid option when comparing the Nest Yale vs Schlage software. There is a little learning curve for using either SmartThings or Wink to control your lock, but it’s not too complex for most smart home techies. It actually gives your smart home some flexibility and room to grow outside of a certain brand. As long as you know what you’re getting in to and know that a sleek Schlage app doesn’t exist, you should be fine. Currently has no Alexa or even Google Assistant voice controls. This is a big negative when looking at the differences between Nest Yale vs Schlage. Nest claims it will add voice controls to check the status or locking your door. Works with other Nest products really well. Besides sharing the same app, it also can disarm your Nest Secure system when the door is unlocked. It is also within the Works with Nest platform, which is compatible with many third-party devices. Works with Alexa to lock, unlock, and check the status of your lock (as long as a hub is installed). Unlocking the door requires a 4-digit pin as a security measure. Z-Wave compatible. 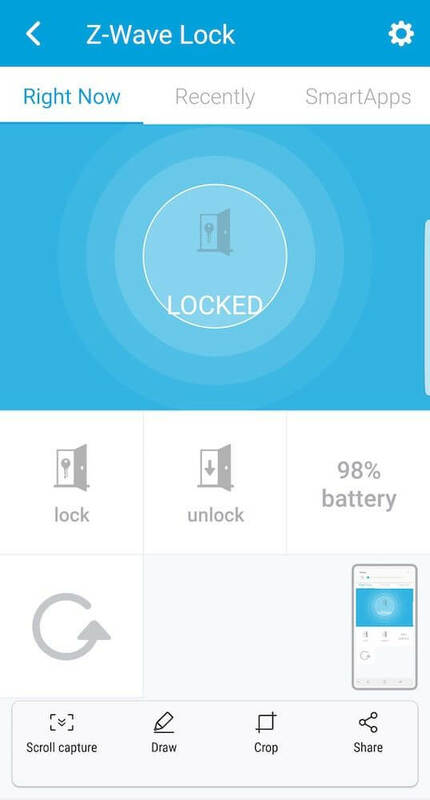 Once it’s connected with your SmartThings or Wink hub, you will be able to easily automate your lock and set rules for the lock and other Z-Wave devices around the home. While HomeKit isn’t available for Schlage Connect, if you purchase the very similar Schlage Sense then you will have HomeKit compatibility. IFTTT is available and easy to use. This adds an additional layer of home automation for extending your options outside of the app. If you buy Schlage Connect, make sure you download and connect IFTTT to see all of the additional automations that are possible. It’s hard to argue against Z-Wave compatibility. Combined with a hub like Wink or SmartThings, you can easily automate other Z-Wave devices around your home with your Schlage lock. When you lock the door, you can have the lights turn off, thermostat adjust, and motion sensors arm. You can outfit your entire home in Z-Wave technology and automate it all using the Wink or SmartThings app. I can also appreciate Nest’s cohesive smart home experience that allows all of their devices to work together easily. For those who want an easy user experience and are not looking for all of the bells and whistles (or the extra cost) that comes with a smart home hub, Nest will still feel like true smart home tech. Just know that you’ll need to be a Google Assistant user rather than someone who loves Alexa, since it’s not likely that this lock will work with Alexa anytime soon. This was as close of a call as it gets. While I really appreciate both of these locks, Schlage squeaks out ahead because of its Z-Wave compatibility, extra customization using SmartThings or Wink, and awesome built-in siren with chirps to secure the door. The lock was also easier and faster to setup since we didn’t have to chisel into the door frame to get it to fit. If you want a smart lock that blends traditional style with more automation, then Schlage Connect is your pick. But wait! Nest x Yale is still great! In fact, I recommended it for my parent’s new AirBnB since I knew the app would be easier to manage and the lock is better looking for guests. If you have a Nest thermostat or other Nest smart home products, then you’ll want to really consider Nest Yale, which will keep things simple while still offering tons of automation and smart home features. A few other smart locks to look into are the Kwikset and August locks; we compare those with Schlage Sense in this article. We also broke down the different August locks in case you’re interested. Ultimately, this comparison comes down to personal preference and your own setup. So tell us in the comments: what’s your pick between Nest Yale vs Schlage? We opted to buy two Yale locks, one for our front entry door which is rarely used for coming and going, except for dog walks and trips to the curbside mail box, and one for the door between the kitchen and the garage which is a frequent point of exit and entry, since we park in the garage and bring groceries etc in that door, plus depart via that door for work, errands etc. For the front door we chose the older model YRL246 with z-wave plus. It works with Alexa and with our Harmony and SmartThings hub. We are not people who fish our iPhones out of our computer bag or purse to enter codes, primarily because that’s the best way I know of to drop them while juggling mail, lunch bags, groceries, anxious doggies (well, the leash etc not the actual dog) tugging to enter or exit. We wanted voice command and we have it with this model. For the other door, we opted for the updated model YRL256 with Connected by August. The reasoning was simple — this is the only locking solution that integrates with our older (2 yrs!) SimpliSafe alarm system. Coming in the house from the garage with the lock also turns off the alarm, eliminates the hassle of setting everything down to enter the disarm code on the key pad. This integration into SimpliSafe is the single one offered by that company. I would never recommend SimpliSafe to anyone based on several factors, but just let me say it’s been reliable. Setting up both doors was simple. The tapered bolt is a lifesaver in an old home where nothing is square and which is built on expansive clay soil meaning that at any given time in the year several doors don’t close or stick. Our main reason for choosing Yale though was the keyless nature of these locks. No bumpkey can be used to force the door open. That said, for the door to the garage which is essentially an interior door and much less likely to be forced by a burglar who would have to saw open an overhead steel door to get in, we would have probably opted for a single hole lever lock, but there is not one in the Connected by August offerings from Yale as of now. These locks were not purchased on a whim but rather inspired by a rapid upswing of burglaries in our area. We went for security not “smartness” per se. it’s not easy integrating old and expensive equipment like older models of SimpliSafe and wired Swann DVR systems but it would mean tossing over $1000 in stuff, not to mention cost of replacing alarm, 20 sensors, 8 cameras and a DVR. Thought I throw my 2 cents in.